These are lyrics by The Isley Brothers that we think are kind of repetitive. 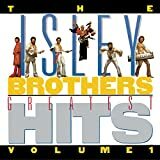 The Isley Brothers', "Land of 1,000 Dances"
Enough 'na's'! Can't they come up with anything else for filler?